The Big Crash and New Bedding. I owe a big apology to those of you that dropped by last week for the Open House party. My laptop crashed on Tuesday evening and I just got it back from the shop yesterday. Everything is back to normal and I hope to see you at the party this week. You know how much I like anything blue and white so you can imagine how deeply I feel in love with this comforter I found on Pinterest. The comforter cover was originally sold at Macy’s and Saks Fifth Ave. After seeing the price of $440 for just the comforter cover I knew my love would go unfulfilled….sigh! Months later while browsing through Joss and Mann I saw the elusive comforter cover for sale. At the price of $70 for a king I couldn’t order it quick enough! A search on EBay landed me the linen bed skirt at a fraction of the original price. The bedding has been discontinued so I am still looking for the pillow shams. I have a beautiful antique linen tablecloth that is the same soft blue color and I may have this made into shams. When I received the bedding I was thrilled. It is even more beautiful than pictured and the color is the prettiest shade of soft blue. I am so excited to be going home in March for the first time in seven months. I am taking dad with me and we plan on being there for a few weeks. Pictures of our bedroom with the new bedding will be posted then. That is such a bummer to have computer problems, I'm glad it got resolved. I love the color of the bedding, it's so feminine. That's what I call a very beautiful deal! I'm glad you found it! It's beautiful! I bet it'll be great to be home for a few weeks. i always love it when you can find something you REALLY, REALLY want at a great price…looking forward to seeing it in your home in March. hope your dad is doing good. Hi Sherry! Oh, I love it that you found those wonderful bed linens at at such a discount! Can't wait to see yours. Have a great time with your Daddy! Gorgeous! Can't wait to see it in your room!! The blue comforter is absolutely stunning! I love the pattern! I'm now a follower of you – here and on Pinterest. Everything about your blog is so elegant and classy! My own style is more country-casual, but reading your posts makes me feel as if I've picked up a very expensive magazine to browse through! I'm delighted that you are a grandma too! Best wishes! The blue bedding is so pretty! Just makes you want to fall right into the bed and get lost for a while. Heavenly! It is gorgeous! I went with blue this time around in my bedroom too. It is so serene. I think blue and white is so fresh looking. It's lovely. Too funny! I just wrote a post on how much I love blue and here is this gorgeous comforter! So glad you were able to get it! I hope your Dad is doing well….being a caregiver is tiring….remember to care for yourself too! love the set classic and dreamy at the same time..glad you will be home for a while and admire you for your care and devotion to your Dad..
Sweet deal on the linens and it almost makes up for the computer crash! It must be a relief to go back home, even for a few weeks. I can't wait to see the new bedding, since I have blue in my mind lately. Thank you so much for following me. 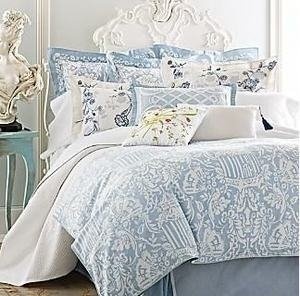 Beautiful bedding, such a soft blue and the pattern is perfect. Hope you find your shams, if not I'm sure your plan will work perfectly! So excited to see it once you have everything together! Wow, you got a fantastic deal- I love that bedding, such a pretty blue. Have a safe trip back home. Beautiful comforter!And what a great price too!Love,Love,Love that color! I am on the hunt for some new bedding, I can't wait to check out Joss and Mann! See you this week at Open House Thursday! What a great deal, Sherry. Still keeping you all in my prayers. Sherry that bedding is gorgeous and I cant wait to see it in your home! Have a safe trip home! Can't wait till THT! Your new bed linens are gorgeous. How lucky to find the pieces at a really great price. Looking forward to seeing it in your home. Thanks for hosting the party. Glad you were able to get your laptop fixed. It's such a pain when they crash. Your new comforter is gorgeous, Sherry! I'm so happy you were able to find it for such a great price. That's great!! No wonder you fell in love with it, it is gorgeous! I am glad you are finding the pieces at a much better price. Can't wait to see it in your room! Have a great time with your Dad!